On April 8, we posted a blog entry marking the one-year anniversary of our creepy-funny game Ossuary's journey on the Steam Greenlight service. On April 13, the game was approved, letting us start preparing it for release on Valve's major online storefront. While it's easy to assume that the article informed enough new folks about the game to push it over the edge, that's not clear from the numbers. One of Steam Greenlight's primary metrics it provides to developers is their "percent of the way to the top 100" games on the service. This is measured by the number of "yes" votes received. The implication is that, since Greenlight has historically approved 50-100 games in a batch every two weeks, being in the top 100 gives you a good chance of being in the next batch. Valve stopped releasing an easy-to-read list of the games in each batch back in mid-2014, so we don't know how well this pattern holds up. However, we can say that we were probably not near the top 100. On the 8th, we were 84% of the way to the top 100, with 1,573 "yes" votes. In the days after posting about Ossuary, our ranking actually dropped to 83%. We expected this; even with extra attention, Ossuary is less immediately appealing than other games. We gained votes, but other games gained votes faster, so we dropped slightly. Even after Greenlighting, we were far from the top 100. 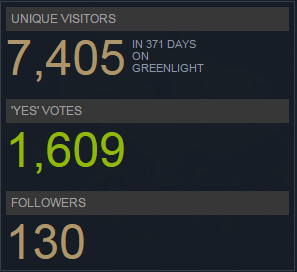 On April 13th, just after getting Greenlit, we had 1,609 "yes" votes. This still put us far below the top 100; according to Steam, the #100 game had roughly 1800 "yes" votes. Steam reports 1,642 games on Greenlight; assuming that the "percent to the top 100" number is a percentile rank among all but the top games, that means that at 83% there were about 360 games above us (280 if it's a pure percentile). Steam tracks visitors to your Greenlight page, and that doesn't stop once you're Greenlit. In the span of April 8-13, it seems we had a total of 76 new visitors to our page (the graph appears to have an off-by-one issue), resulting in our increase of 36 "yes" votes. In terms of our nearly 7,500 total unique visitors, this bump is a drop in the bucket. So: we were most likely not anywhere close to the top 100 during a periodic batch. How, then, did we get Greenlit? We have a few possible theories. Valve may examine huge batches. If the folks who make the final decision on Greenlighting look at the top 300-400 games at a given time and pick ones that look legitimate, that would explain how we got picked despite being far from the top 100. We think this would require a very large batch size, too; otherwise, there are enough high-quality games on Greenlight that we think the curator would run out of slots in the batch before getting down to Ossuary. Our traffic spike was small but noticeable. Valve may take traffic spikes into account. In absolute terms, our Greenlight traffic increase from our post was not huge. However, compared to our numbers for months previous (a visit or two every few days) it was at least a 1000% boost. It may be that Valve has some system for monitoring when games get sudden attention that highlights them as noteworthy for Greenlighting. Valve may evaluate games that hit time milestones. It would make sense for Valve to review games that hit six- or twelve-month milestones on Greenlight to check if their voting matches their potential. It may be that the anniversary that triggered our article also triggered an internal review, making the two events only indirectly related. We may have gained an admirer on the inside. Note that we have no evidence for this; it's just wild speculation. However, our recent piece on Ossuary was cross-posted to Gamasutra, a major games professional website, where it was featured on the front page in the "From the Community" section. It's entirely possible that a Valve employee, or a friend of one, saw the article there (or on Twitter or elsewhere) and decided that the game should be Greenlit. Valve markets the Greenlight process as quite impartial, but there's likely some room for individual initiative. It's a little disappointing to end this post with a big shrug, but we're not sure how the Greenlighting happened. Clearly, being open and detailed about our situation made it occur somehow. The timing is just too close for the events to be entirely unrelated. However, there's just not enough information to get a real answer. Valve gives a lot of statistics concerning Steam Greenlight submissions, but they lack useful context. We don't know how the decisions are made. This makes sense; it lessens the risk of furious fans and devs and makes it harder to game the system. Still, it's frustrating to wait for a year and then be inexplicably let in. Our celebratory dinner the evening we were Greenlit felt less joyful and more baffled and unmoored. We'd like to see more clarity from Valve concerning the Greenlight process or whatever takes its place in the future. Due to non-disclosure agreements, we can't be as open about the Steam onboarding process as we have been about Greenlight, but it suffices to say that it's been a lot smoother and Valve offers much more support. Ossuary should come to Steam before summer. It's already available on our website and other online storefronts. Our next game, Exploit: Zero Day, is currently in closed alpha. You can visit the site to join the mailing list and be next in line to get free access. 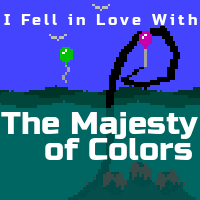 Please share your theories on how we got Greenlit in the comments.